In this post we talk about our sweet and spiney friend, the Hawaiian Pineapple. At Hawaiian Ola, pineapple is a loved ingredient for its unique tropical taste and also its health benefits. Here are ten sweet facts about weird and wonderful pineapples. Pineapples are members of a larger family of plants know as Bromeliaceae or bromeliads. Of the 3,000 or more species we know of (mainly found in the tropics in the Americas) pineapple is the only species that produces sweet edible fruit! Indeed, pineapples grow very slowly, which has something to do with how expensive they can be. In ideal tropical growing conditions, it can take two years for a pineapple to mature to full size. Pineapples are usually picked when they are just a few pounds, but allowed to grow undisturbed they can reach up to 20 pounds! Pineapple has a great sweet-to-calorie ratio, which means for the all the sweet and flavor sensation we experience eating and drinking pineapple, the relative calories are low compared to conventional sweeteners such as cane sugar. For instance, 4 ounces of pineapple only adds up to about 50 calories. Pineapples have been found to contain an enzyme known as bromelian, which has been shown to reduce inflammation. Although more research in needed to understand the effects, bromelian is being considered as a powerful plant-based treatment in conditions such as osteoarthritis. 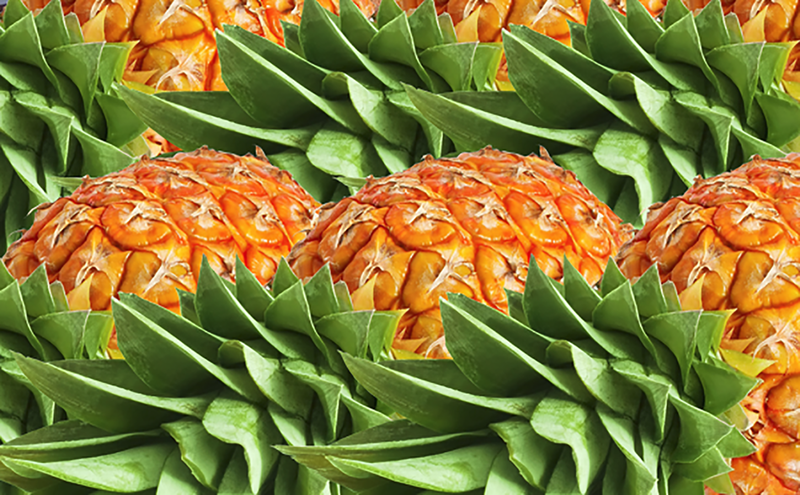 When pineapple was first discovered by Europeans the flavor was an instant favorite. Unfortunately pineapple didn’t travel well on long ocean voyages and was highly perishable. The solution was to preserve pineapple in sugar as a candied fruit, which is still enjoyed throughout the world today. While it’s not a major problem in modern times, scurvy—caused by not getting enough Vitamin C, used to be a serious problem in days of early sea travel. Pineapple was then, and is still today, a great remedy to vitamin C deficiency. A single 4oz serving contains about half of your daily need. These days many of us have easy access to all kinds of pineapple in canned, juiced, and whole fruit form. However, only a small portion of pineapples are grown organically. The benefits to eating organic pineapple is that they’re grown without the use of harmful pesticides and herbicides. In the last 100 years, pineapples have become a symbol of Hawaiian agriculture, however, the plants are not endemic to the islands. Records show that pineapple arrived in Hawaii as recently as 1813. Hawaiian pineapples are thought to have originated in Paraguay or Brazil. When pineapple was first brought to Hawaii, it was first called “anana”—a Caribbean word for “excellent fruit.” Hawaiians called it “halakahiki,” which means “foreign fruit.” The name pineapple harkens to the first European encounters with it, which to them resembled pinecones from conifers. We feature organic pineapple juice in several of our products, including our Pineapple Punch sparkling noni and our Noni Energy and Noni Immunity juice shots. Each of them gives you the health benefits of pineapple and a taste of the tropics.